MASKerade: Holiday Inspirations Crew - New Year's! Holiday Inspirations Crew - New Year's! Welcome to the final (for 2013) Holiday Inspirations Crew blog hop! This time we're doing a 1 day event to provide you with tons of inspiration to ring in the New Year! We're making projects using products we like and some of us are even offering prizes. Check each blog for which prizes are being offered and when the winners will be announced on that blog. I went ultra simple for this one. MSE Parfait numbers, the '1' substituted with a branch from a tree and a Stampin' Up starburst stamped in Versamark/Summer Sun and then embossed in Egyptian Gold for sparkle. The kids are finished school for two weeks and last minute preparations are underway. Tomorrow (Sunday) is our much-anticipated performance of We Three Spies (our Christmas musical at church). I hope you have some fun plans for the weekend! Don't forget to stop by the other members' blogs for some more New Year's Inspiration. Happy New Year! ETA (Jan 3): This card was chosen as a favourite! Woohoo! Just love your style Ardath, beautiful card. 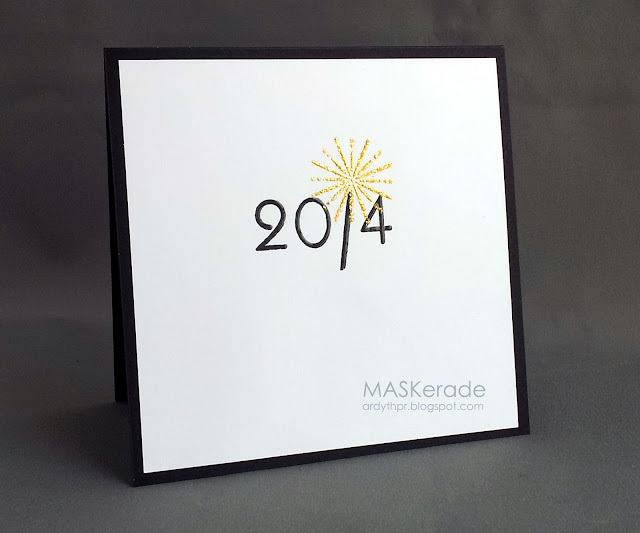 What a clever image, just the perfect New Year card and so quick to do. Echoing Darnell: fabulous card and yes, definitely should be a 2014 logo! LOVE it!! Another perfect graphic design. The church musical sounds like it should be a lot of fun. This is so pretty and elegant- love it! THE perfect New Year's card! I love it. You are so creative--love checking your blog, Ardyth! Egyptian Gold--love that powder & need to get mine out! What a super fun new year's card. I really love your gold embossing. Yep....this soooo needs to be on something - beyond clever once again! Clever, clever, you clever girl! I get so excited seeing such creative designs like this. It's so difficult to create such a strong message with so little space. Kudos, and thanks so much for joining the CAS-ual Fridays Challenge! Love the simplicity and beauty of your card. Very striking. This is gorgeous! I love the splash of gold. :) Merry Christmas! Ardyth!!! This is just the perfect new year card with the splash of GOLD.....LOVE LOVE!!!! Thanks so much for playing with CAS-ual Fridays!! Gorgeous! Lovely card overall! Thansk for playing with us at CAS-ual Fridays! Well Deserved, I saw alot of my FAVE peeps on the Honor roll and FAVES List!!! Wowzer! Loves it! !